Le Silence des Sirènes for soprano and orchestra received its world premiere on August 23, 2014, at the Lucerne Festival, with soloist Barbara Hannigan and the Lucerne Festival Academy Orchestra conducted by Sir Simon Rattle. It premiered in Germany the following summer, on June 24, 2015, with the Berlin Philharmonic, again performed by Barbara Hannigan and conducted by Sir Simon Rattle. The following conversation was conducted in German and English at Unsuk Chin’s home in Berlin shortly after these debuts. Music & Literature is pleased to feature Unsuk Chin in a major portfolio dedicated to her work in our latest print edition. Unsuk Chin introduces Le Silence des Sirènes for soprano and orchestra at the 2014 Lucerne Festival. Photograph courtesy of the Lucerne Festival. Copyright Priska Ketterer/Lucerne Festival. But contemporary composition has an ambivalent relationship to the voice, because you can’t use the voice without evoking emotion. Many contemporary composers have tried to do something abstract; they want to avoid all these Romantic emotions, and that can lead to a dead end of sorts. They still want to write for voice, but first they have to invent an entirely new kind of music, a new way of using the voice. I’ve been composing for voice since the eighties, and with every new composition comes a new struggle, but a valuable one: I have to negotiate where my work falls within this modern context. At the beginning of my life as a professional composer, I tried to use the voice as an instrument, not as a means of transmitting any content or semantic message. I wanted to work with texts as a flexible material for compositional procedures; my Cantatrix Sopranica, which was inspired by the ideas and techniques of the Oulipo, is a good example of that, with its self-referential and combinatorial games. So I tried to write for the voice as a quasi-instrument—that’s where the Akrostichon-Wortspiel came from, for instance—but even there, every piece has a certain fundamental emotional mood, and you can’t get write these underlying affects out of the music, it’s not possible. After that I wrote a few more pieces, each one with a relatively abstract use of the voice. But composing my opera Alice in Wonderland was again a completely different experience. In opera, you have to tell a story, just the way composers in the past have done. The storytelling in my Alice in Wonderland, which of course is based on Lewis Carroll, is unusual with its jump cuts, paradoxes, and dream-like states—but it is still a story. Moreover, the heroine is a child, which also affects the musical style and content to a degree. In my most recent vocal work, Le Chant des Enfants des Étoiles, for choir and orchestra, the text-music problem was approached in a different manner: I deliberately set only poems which refer to cosmic or other natural phenomena. Le Silence des Sirènes, on the other hand, is a monodrama with an imminent theatrical element, so the approach was again a different one. I know that Le Silence was a commission, that you had Barbara Hannigan in mind from the start. How did her selection, that is, her particular voice and presence, shape the composition? I would love to know more about this work’s genesis. Unsuk Chin discusses a passage of Le Silence des Sirènes Barbara Hannigan and Sir Simon Rattle prior to its premiere performance. Photograph courtesy of the Lucerne Festival. Copyright Priska Ketterer/Lucerne Festival. One of the late short prose pieces? Yes, Worstward Ho. Everyone advised me against it, warned me that we would have trouble with rights—I remember Simon saying: “Samuel Beckett?! Be careful, be careful!” For heaven’s sake, composing a piece of music is difficult enough without adding more problems on top of it! So I distanced myself from it a bit, and my search continued, and eventually I thought: sirens would be interesting, but so many people have already written about them, so if I do that, I’d have to do it differently. So I started to look beyond the classical sirens, and I found Kafka, and then Joyce, Adorno also wrote about sirens—I found a lot. I’m a very intuitive person, and the sirens made me smile, somehow. I felt there was something there. And in Barbara’s face, too! That too! Exactly—her, and sirens, and these texts—I thought, this is a direction worth pursuing. I had a lot of texts and ideas from many different sources, I did a lot of research and eventually worked through all of this material, and finally I came to the title, which comes from Kafka and his idea that the silence of the sirens was a far more dangerous weapon than their song. Of course I couldn’t express this idea musically—although, in the original version, which was done in Lucerne, at the end, Barbara pretends to sing, and I deliberately wrote notes that were completely unsingable; it was impossible, they were so high—but in fact, she isn’t singing. Those notes are played by the instruments, and she just acts as though she’s singing. I wanted to use a deceptive bit of stagecraft, so to speak, so that in the end you don’t know who is producing the sounds. This didn’t work perfectly at either premiere, because the instrumentalists were sitting too far behind her and the effect as wasn’t immediate as I’d intended it to be. But the conceit of deception—this came from Kafka. Barbara is actually silent at that moment, but her movements are so despairing and distraught—she did a wonderful job. After the premiere, though, I went back to the music and made some revisions, and the modified version was performed in Berlin, where she actually sings until the end. And then the title: the sound of Kafka’s title itself is deeply compelling, which is why I chose it. From the working manuscript of Le Silence des Sirènes for soprano and orchestra. Courtesy of Unsuk Chin. Because it’s beautiful! Kafka’s original German title is Das Schweigen der Sirenen, but it sounds less mystical, for whatever odd reason it reminds me a bit of Das Schweigen der Lämmer (The Silence of the Lambs). So it was a sonic, not a semantic, decision. Yes. For a composer, the title is the face of the piece, and that is very important. My decisions are often based on the sonic aspect. Just because of this, in Le Chant des Enfants des Étoiles, I had poems by Edith Södergran and Eeva-Liisa Manner translated into English. And for one movement of Cantatrix Sopranica, I did my own spoof version of a poem Arno Holz, and I had it translated into Italian, and this fake Italian poem turned into a parody of aria clichés. (I felt myself confirmed when, at the premiere of the piece in Paris, an Italian couple sitting behind me burst into irrepressible laughter.) But back to Le Silence des Sirènes: for the content of the work, I narrowed it down to a classical source—Homer, in this case—and James Joyce. And I wanted to show these different facets on several temporal levels: sirens in antiquity were mystical creatures, and in James Joyce they’ve become barmaids. I wanted to put all these different roles together into one piece. The work consists of numerous tiny fragments which are connected to each other in a manner that resembles a musical labyrinth. Does Barbara sing the entire Greek passage about the sirens? It’s formulated musically, but also linguistically. Yes, linguistically, musically, and it’s so lively, with so many twists and turns, so many emotions, references, and associations—it’s incredible. When I used this James Joyce text, I approached it the same way I’d approached Akrostichon-Wortspiel. It was wordplay—words supplied the emotional basis, but at the same time they just were abstract tools. This whole James Joyce part—the text composed it, not me, I felt that I just translated it into music. There were incredibly compressed fragments, and I did that musically too, and so it seemed, to the people who first heard it, too fast. It makes one a bit dizzy. That’s the first two thirds; after that comes a quieter part with the classical sirens, and for that I used the Homeric text, which runs until the end. There’s a continuing intensification, right until the end. Barbara provided a very interesting interpretation by way of Joyce—the siren is putting on a show of her strength and allure, but at the point when the music becomes quieter, she confronts the realization that this is all a performance, that she is bound to fall short. Exactly, and that’s where its modernism is evident. It’s the same in Kafka—who re-writes the Homeric myth—or in Joyce, where it becomes quotidian, and the old, heroic aspect that we found in the Greeks is gone. We don’t have it anymore. No, it’s gone, and that abyss is what I wanted to express musically. Barbara did this so well—you feel the emotions yourself, you get sad—I’d never written this kind of tragic music before. This kind of sentimental or tragic, melancholic atmosphere had never appeared in my music before. Barbara Hannigan, Sir Simon Rattle, and the Berliner Philharmoniker deliver the world premiere of Le Silence des Sirènes for soprano and orchestra, August 23, 2014. Photograph courtesy of the Lucerne Festival. Copyright Priska Ketterer/Lucerne Festival. To what degree does the input of a collaborator like Barbara Hannigan or Simon Rattle actually influence the writing? I’m curious as to how the work changed in the process of rehearsing it. You kept making changes until the last moment, no? If you were to record Le Silence, would this be your final version? Yes, it is, this is the final version. I only revised the ending, so that she’d continue singing, and when you collaborate with singers, you have to revise certain things, because singing is different than playing an instrument. For example, a particular note doesn’t work so well for the singer because she needs to breathe then—you just have to make compromises. And there are so many different types of voices. Generally speaking, I don’t collaborate closely with the artists during the gestation of the work. I write the piece, they learn it, and at some point we have a rehearsal, and then it’s like a wonderful gift if the performer discovers something new in the work, if they put their own stamp on it. I think this mutual trust is very important. But what was crucial during this composition process was Barbara’s artistic personality. For instance, the theatrical effects—when I was composing the piece in my head, I already had these components in mind. The piece would begin in an unusual way, but I wasn’t sure exactly how. What I didn’t want was for the singer to enter with the conductor, take a bow, and start singing. She had to make a different kind of entrance. Actually, I wanted to start with James Joyce, so that she would charge onto the stage from the back, screaming. But then I saw the stage in Lucerne and realized this was impossible—there was no room for that, she would have tripped on something. (In the Berlin Philharmonic, it would have worked.) So when I compose, I have lots of ideas, and then I throw them away and get new ones, and keep thinking, so finally I decided to start it quietly. I started with the classical sirens, and Barbara starts singing offstage. Of course every time it’s played, the location where she starts is different, but the idea is always that it starts in the darkness, that she’s not visible at first. And then she slowly moves toward the stage and transforms into a barmaid; that’s the idea. And then, especially in the James Joyce part, the fragments change very quickly, and I thought, Barbara is so experienced, she always has a lot of good ideas, so when she sings this, she can definitely invent these facial expressions and movements. I didn’t say anything to her, though, and until the last rehearsal, she didn’t do anything, she only sang, and we didn’t know how she was going to enter or what kind of expressions she was going to make. And then at the concert, her performance was so compelling, her complete understanding of the music and its content so evident. I hadn’t seen her dress beforehand either—and her hair—wow! There was a real siren on the stage! Incredible! From the German premiere of Le Silence des Sirènes for soprano and orchestra, by Unsuk Chin. 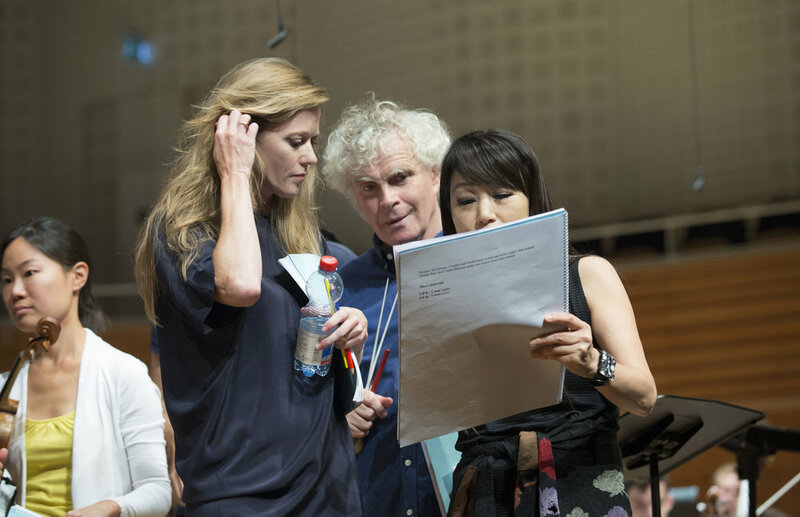 Barbara Hannigan, soprano, and Sir Simon Rattle, conductor, with the Berliner Philharmoniker. Recorded at the Berlin Philharmonie, 25 June 2015. The full concert can be viewed here. Unsuk Chin is a Berlin-based composer whose music has been championed by international conductors including Rattle, Salonen, Nagano, Dudamel, Gilbert, Chung, Mälkki, and Robertson. Portrait CDs and DVDs of her music have appeared on Deutsche Grammophon, Unitel, Kairos, and Analekta. Daniel Medin, co-editor of Music & Literature, is Associate Professor of Comparative Literature at the American University of Paris and a director of its Center for Writers and Translators. Banner image: (from left to right) Sir Simon Rattle, Unsuk Chin, and Barbara Hannigan take a bow after the premiere of Le Silence des Sirènes for soprano and orchestra, August 23, 2014. Photograph courtesy of the Lucerne Festival. Copyright Priska Ketterer/Lucerne Festival.